More than 140 artists, nonprofit personnel, town planners, economic development officers, performers, and citizens participated in our Shaping Community: A Creative Placemaking Conference on Jan. 23-24 at Stepping Stones Children’s Museum in Norwalk. On Day One, attendees enjoyed seeing the astonishing range and depth of arts and cultural activity across Fairfield County, as panelists bore witness to the impact of public arts, artist residencies, artists’ spaces, theatre and storytelling on shaping and giving resonance to the places where we live and work. On Day Two, 80 participants from 9 towns were guided through the process of creating and crafting placemaking project plans for their towns by senior staff from the National Endowment for the Arts, the Local Initiatives Support Corporation (LISC) and ArtPlace America. Nine proposals were pitched to a panel of funders who gave detailed suggestions and furthered participants’ ideas on how best to produce citizen-inspired placemaking projects. Conference sessions are now available for view individually on the Shaping Community Playlist on our YouTube Channel. Presenters' slide presentations will also shortly be available on Google. Follow FCBuzz.org on Facebook and Twitter for updates on the progress our groups make. The Cultural Alliance of Fairfield County is grateful for the support of our event sponsors: Bank of America, the Barnum Museum, Bridgeport DSSD, Spinnaker Real Estate Partners, and our vey generous host: Stepping Stones Museum for Children. The Cultural Alliance of Fairfield County is pleased to accept nominations for the 3rd Annual Arts & Culture Empowerment (ACE) Awards, designed to celebrate the passion for arts and culture in Fairfield County, and to raise awareness of the quality and diversity of our arts and cultural offerings. Awards in five categories will be presented in late spring at our 3rd annual ACE Awards Breakfast (date and time TBA), to recognize and thank those individuals, organizations and businesses who have made significant artistic and cultural contributions to our community, as well as those who have supported the arts and culture sector through volunteerism and/or patronage. Awards are made in five categories: Artist, Citizen, Corporate, Educator and Nonprofit. Click here to make your nominations. Deadline: March 15. Francesca Andre is a filmmaker, photographer and producer with a Master's in film and television from Sacred Heart University. Her career began in front of the camera as a commercial print model with ads in USA Today, Eyecare Business, Hype Hair Magazine, Essence, BET, Wix, WWE, Mercedes Benz, and Time magazine to name a few. She is now the co-founder, creative director and producer at Optik 21, a photo and video company. Her photography work has circulated in publications such as the New York Post, New York Daily News, News Day, Connecticut Post, Daily Mail, Elements Magazine, Fairfield Living Magazine, Westport Magazine, Sheen Magazine, Afropunk, Global Voices, Heed Magazine and Stamford Advocate to name a few. Francesca's award-winning short film, Charcoal captures the stories of two black women, as they embark on a lifelong journey to overcome internalized colorism, find self-acceptance, and ultimately redemption. The film has been screened at several US and International film festivals and reviewed by The New York Daily News, Essence Magazine,Think Progress, Shadow and ACT, the Daily Voice, Ebony Magazine and Connecticut Post among others. The film captures the stories of two black women, as they embark on a lifelong journey to overcome internalized colorism, find self-acceptance, and ultimately redemption. Francesca was just selected by Connecticut Magazine as one of its 40 Under 40 for 2018. See Francesca's website, Facebook page, Twitter feed, Charcoal Trailer, and CT Post article. Mark Macrides has been an artist and an art teacher working in the area for over three decades. After graduating from Rhode Island School of Design in 1985, he came to the New Canaan Country School, where he currently serves as Chair of the Visual Arts Department, teaching in several grades. He pursued and received a Master of Arts in Teaching from Manhattanville College. The process-oriented Kindergarten Art Program he designed has been a model for other schools and he has presented the program at workshops both nationally and internationally. Mark has historically worked in oils but around 2014 he became fascinated with collage and started working in that medium and had a solo show of his collage work 100 Crosses: An Exploration in Collage at the Loft Artists Association Gallery in Stamford 2016. At the time, he described his experience with the medium as “liberating” and enjoyed the opportunity it presented to work in shorter periods of time. As an art teacher of young children, he used collage in his teaching and was also inspired by the diverse range of materials the children were encouraged to work with in a program that values recycling. In painting and collage, however, color is central to Mark’s work: "I’m one of those people who love working with color ... and painting, for me, fundamentally, gives me the opportunity to put colors together." Mark has served for several years on the Board of Directors of the New Canaan Society of the Arts and Stamford’s Loft Artists Association, where he recently became co-director with Christa Forrest. Paul R. Berger, Tara Blackwell, Nancy Breakstone, Eric Chiang, Heidi Lewis Coleman, Naomi Cruz, Dawn Dahl, Len Grayeck, Mary Harold, Molly Hauser, Gwen Hendrix, Joanie Landau, Julia-Rose Liptak, Nancy Monson, Julie O’Connor, Kaz Oda, Barbara Ringer, Lisa Paulette Silberman, Al Coyote Weiner all have work in Fairfield Library's Bruce S. Kershner Gallery's community show, Movement, opening this Sat. Feb. 3, 4:30-6:30. Prizes will be awarded on Saturday. Congratulations to Eric Chiang, Heidi Lewis Coleman, Nancy Moore, and Florence Suerig, who have been selected for the very competitive MixMaster exhibition, organized by the Mattatuck Museum to discover and recognize the talents of artists in the New England and tri-state region. Works are selected by Juror Sara Shaoul, Director of 601Artspace in New York City. Visitors to the exhibition are invited to cast a vote for their favorite work. The Museum will announce the winner of the Visitor’s Selection Prize at the close of the exhibition. Opening reception Sun. Feb.11, 1-3pm. 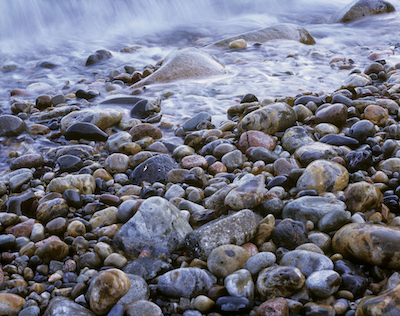 Paul R. Berger, has The Next Wave (archival color print, 16x20, detail at right, click for larger, complete image) from Arcadia National Park in the Bruce S. Kershner Gallery's community show, Movement, opening this Sat. Feb. 3, 4:30-6:30pm. He also has had Zabriskie Point accepted into the 74th Annual Connecticut Artists Exhibition at the Slater Memorial Museum in Norwich through March 16. The 20 x 24" black and white image from film captures a dramatic portion of Death Valley's mysterious and rugged landscape. Tara Blackwell has Untitled (2018, acrylic on canvas, 36x36 acrylic on canvas, at right) on display in the Bruce S. Kershner Gallery's community show, Movement, opening this Sat. Feb. 3, 4:30-6:30pm. Tara writes that "Fascinated by the diverse emotional response associated with color, she is currently exploring the use of abstract monochromatic schemes to illuminate one’s life experiences." Joy Bush has a solo show Attending to the Ordinary at City Gallery (994 State St, New Haven) opening Sun. Feb. 4 1-4pm and running through Feb. 25. At right, Suspended Disbelief, No. 1 (2017, archival pigment print, 36x24, click for complete image). Joy writes: "Shrubberies take on shapes that require us to suspend our disbelief, while patches on sidewalks and roadways, created by anonymous artists unaware of their inventions, are revealed as collections of runes without translations, accidental abstractions which both perplex and fascinate. 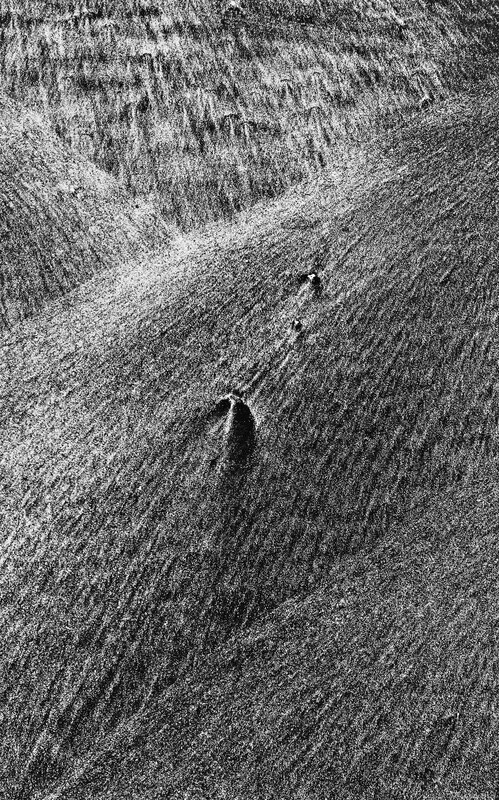 They are small wonders that we usually overlook; these photographs remind us not to." Ann Chernow was invited to exhibit her etching A Kiss In The Dark The Moment They Met It Was Murder, (2014, etching/aquatint, 11x14) in the 2018 Open Printmaking Exhibition at the Salmagundi Club (47 Fifth Ave., New York) that opened Jan. 29 and will run through Feb. 15. 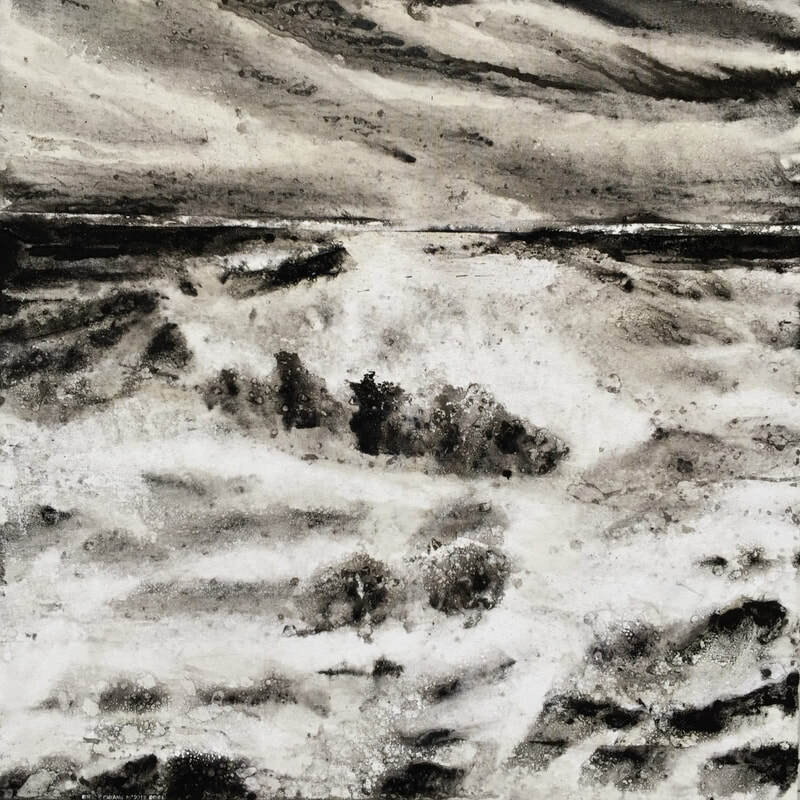 Eric Chiang, had his latest painting Dawn Waves (2018, oil on canvas, 36x36, click for larger image) accepted into the Mattatuck Museum's MixMaster exhibition, opening Sun. Feb.11, 1-3pm. 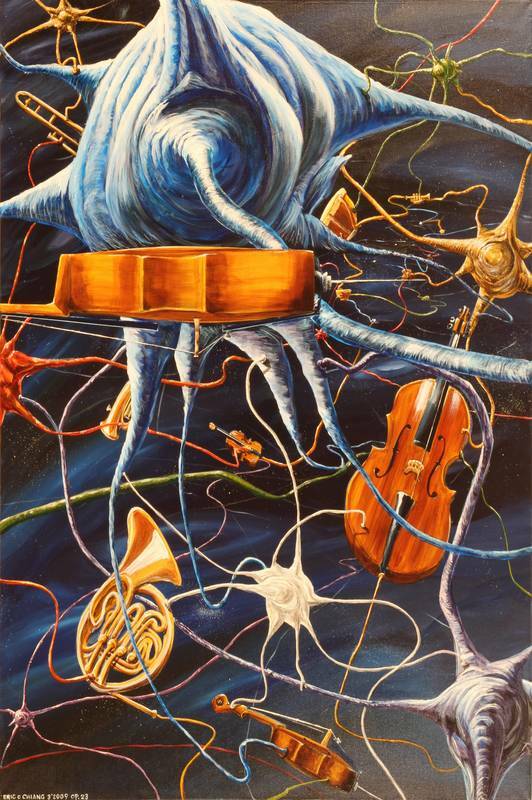 Eric also has Ode to Joy #6 in the Kershner Gallery's Movement exhibit, opening Sat. Feb 3, 4:30-6:30pm, and My Inner Voice (acrylic on canvas, 36x24) at the Worth A Thousand Words exhibition at the Maritime Garage Gallery, through May 11. Heidi Lewis Coleman had her piece Passages (2016, acrylic and cut paper on canvas, 30x30, at right) selected for the Mattatuck Museum's MixMaster exhibition, opening Sun. Feb.11, 1-3pm. Passages is part of Heidi's Dreamscape Series, which reflects an exploration of imaginary landscapes inspired by the ancient lands of mythology and cultural lore, whether historical, fictional or fantastical. 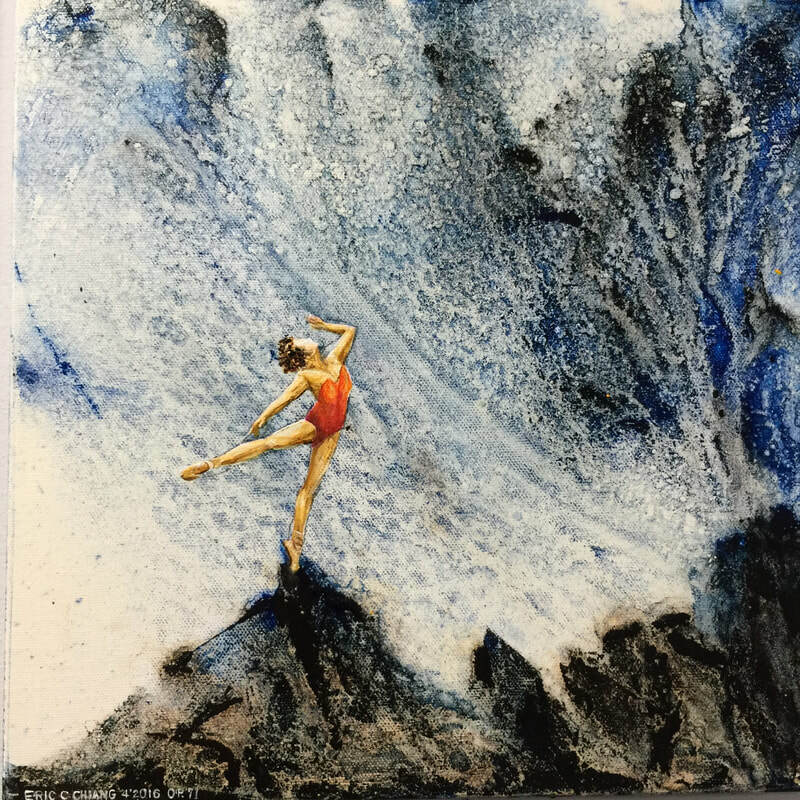 Heidi also has a painting in the Kershner Gallery's Movement exhibit, opening Sat. Feb 3, 4:30-6:30pm. Naomi Cruz is showing her brand new Girl in Hurricane (2018, acrylic on canvas, 24 x 30) that depicts a young girl caught in a hurricane, hair flowing, hands out stretched, trying to flee, in the Bruce S. Kershner Gallery's community show, Movement, opening this Sat. Feb. 3, 4:30-6:30. Steinway Artist Joyce DiCamillo will perform in a concert, Give Your Heart to Project Music with her jazz trio on Sunday, February 11, 3pm at First United Methodist Church in Stamford. The concert will benefit PROJECT MUSIC, of which Joyce is a co-founder and Board Chair. Project Music is a nonprofit El Sistema program launched in 2014 for Stamford’s underserved children, providing them with free music lessons four days a week; the program’s goal is to effect transformative and positive social change via music education. Dawn Dahl is showing Out of the Blue (2017, oil on canvas, 19x25, detail at right) in the Bruce S. Kershner Gallery's community show, Movement,opening this Sat. Feb. 3, 4:30-6:30. This painting began as an exercise with a haphazard set-up of disparate objects that Dawn says she "abstracted" in layers and layers of paint, and she thinks you could almost say this painting came from “Out of the Blue.” Dawn is also showing Daisy, Daisy, an 11x9 oil on canvas in the National Association of Women Artists’ Winter Small Works Exhibition, Feb. 1-27, at the NAWA Gallery, 315 W. 39th Street, Suite 508, NYC. 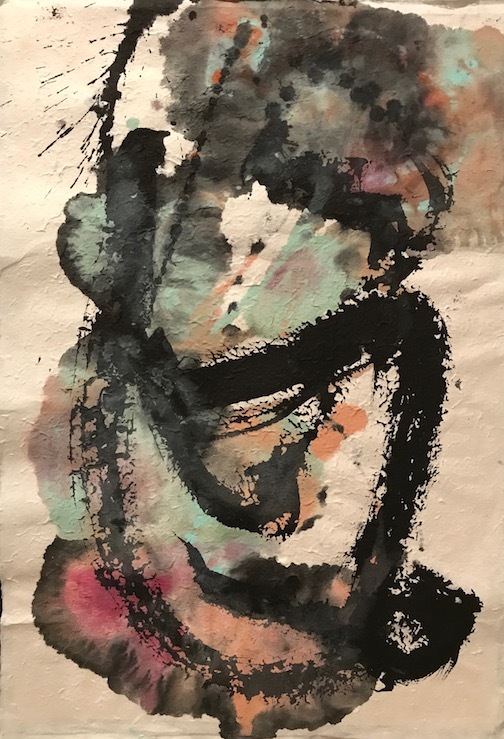 Ellen Gordon has a solo show, Alter Ego in which she shows works from her Alter Ego series of small works on paper that speak to the spontaneous freedom of creating artwork from life. These small works have been the basis for her signature figurative collage pieces which will also be in the show. At right Alter Ego #6. Upstairs at the Ridgefield Guild of Artists. Opening reception, Sun. Feb. 4, 1-3pm for this show’s opening reception. 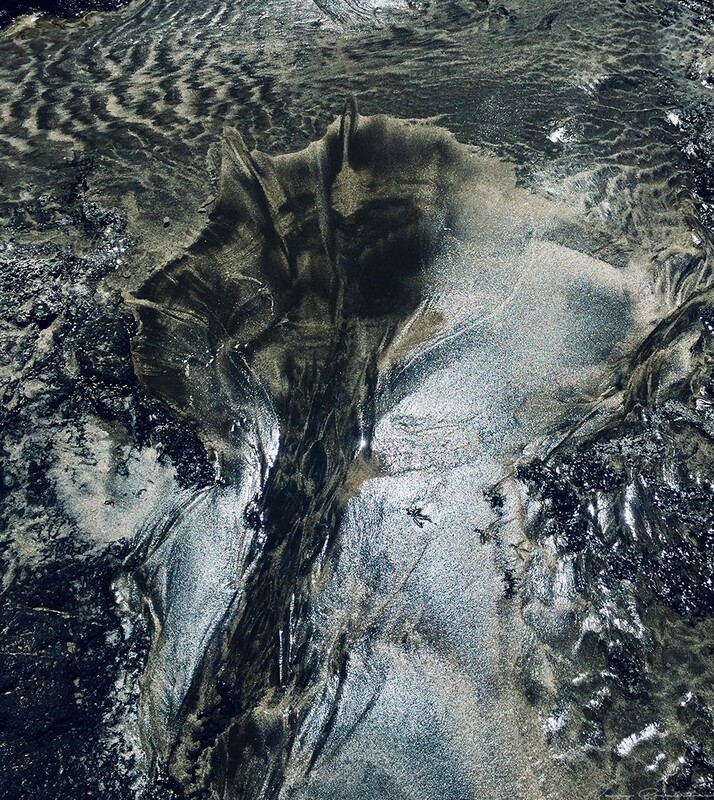 Mary Harold is showing her photograph Alien Abduction (2017, digital photograph, printed on metal, 12x24, detail at right) in the Bruce S. Kershner Gallery's community show, Movement, opening this Sat. Feb. 3, 4:30-6:30. The picture was taken at the Danbury Carnival. Mary says, "While snapping the shutter, I quickly rotated the lens to capture the turbulence of the ride. I loved how the planets seem to spin out of control." Bruce Horan has a solo show, Same Day Different City opening with a reception at the University of Connecticut - Stamford Art Gallery (1 University Place) on Sat. Feb. 10, 2-4:30pm. The show consists of Bruce's paintings that explore the different experiences one may encounter while navigating the urban landscape. It runs through March 18. Richard Koleszar has a private show of mostly recent oil paintings at 100 Washington Blvd, Harbor Point, Stamford, through mid-March. It includes On the Rocks (detail at right). Richard also has two small oils in the Easton Arts Council's Winter Celebration of the Arts exhibit at the Easton Library: one, a street corner in London, the other, an Amtrak train pulling into Union Station terminal in Washington D.C.
Joanie Landau's Love + Courage was selected for the juried show Focal Point: The Art of Digital Media, hosted by the Maryland Federation of Art at the Circle Gallery, Annapolis, through Feb. 24. She also has two pieces on display at the Los Angeles Center for Digital Art: Current Status (detail at right) and Love + Courage Blue through Feb. 8. All three are 30x40 digital collagraphs, printed on archival ink jet paper, and are from her Sticker Shock and Signs of the Times series. Julie Leff has 15 paintings in a four-person show, A Couple of Couples at the Wilton Library that opened Feb 2 and runs through Feb. 23. At right, inspired by Bonnard’s use of rich backgrounds, Still Life with Cake, (2017, oil on canvas, 32x24, detail, click for complete image) is the sixth painting in a series of still lifes in which Julie says she combines a traditional still life foreground with an abstract background, allowing the two to compete for the viewer’s attention. Julia-Rose Liptak has her painting, Take a Bow (2017, acrylic with palette knife, 16x20, detail at right) included in the Kershner Gallery's Movement exhibition opening this Sat. Feb. 3, 4:30-6:30. Julia-Rose comments that her painting is inspired by tulle fabric and the interactive movement of this material in performance and is meant to evoke imagery of ballet, dance, celebration, and fashion. Nancy Moore had her watercolor I Rise (49x39, detail at right) juried into the Mattatuck Museum's MixMaster exhibition, opening Sun. Feb. 11, 1-3pm. Works were selected by Juror Sara Shaoul, Director of 601Artspace in New York City. Nancy comments that this painting is "a 'me too' statement about rising from adversity and flying free." Kaz Oda is showing his Winding Journey (2018, oil on canvas, 21x28, detail at right) in the Bruce S. Kershner Gallery's community show, Movement, opening this Sat. Feb. 3, 4:30-6:30. The painting is a depiction of the rugged landscape of North West England's Lake District. Kaz comments: "Our life is sometimes just like this, up and down, winding, rough dirt road: not always easy, but you need to keep moving." Amy Oestreicher is gearing up for the next time she is bringing her one-woman musical, Gutless and Grateful to Washington DC: Feb. 23 and 24 at the Atlas Intersections Festival 2018. Melissa Bisbee Orme is showing her painting Bluegreen (2017, acrylic on paper, 22x30 unframed, detail at right, click for complete image) at the Katonah Museum Artist's Association's exhibition, The Blues at the Ridgefield Guild of Artists' Gallery, Juror David Dunlop. The show opens with a reception, Sun. Feb. 4, 1 - 3 and runs through March 4. Book artist Chris Perry was awarded "Curator's Choice" award in the Silvermine Art Center's Guild Group Show Nov. 25-Dec. 22, 2017. The show was curated by Eric Ben Kiki, Owner & Director of EBK Gallery in Hartford, and the prize was a solo show at the gallery. Chris' new show is curated by Silvermine's own Jeff Mueller, and the show, Altered Books, opens Sat. Feb. 10, 6-8:30pm, and runs throughFeb. 28. At right, Ripples148:reef (2014, altered books). Alissa Siegal also recently participated in a Forensic Sculpture workshop in which the New York Academy of Art partnered with Joe Mullins, sculptor and forensic artist at the National Center for Missing and Exploited Children, the NYC Medical Examiner, and officials from Pema County Arizona to attempt to restore victims' identities through facial reconstruction. Alissa was one of 13 artists who spent a week reconstructing faces on skulls of unidentified victims from NYC cold cases and attempted border crossings in Arizona. The busts will be displayed this Spring in NYC, and the group is looking for other venues. Contact Alissa if you have ideas for getting the faces seen. Florence Suerig has had her Invisible Man (2017, ink and acrylic on handmade paper, 18x24, detail at right) accepted into the Mattatuck Museum's MixMaster exhibition, opening Sun. Feb. 11, 1-3pm. This is one in a series of mark-making on paper that she sees as her homage to Japanese mark-making, or calligraphy. She says that after many years of working with porcelain, paint has become her current medium of choice. Ann Weiner will be giving a talk on "Art as Activism" as part of a special tour of her exhibit When Caged Birds Sing at the Housatonic Museum of Art, Thurs. Feb. 8, 7pm. This installation of eight life-size sculptures that represent current day heroines for Women’s Rights. Earlier that day a panel discussion, Out of the Shadows will feature experts on urgent human rights issues. Ann's talk and the special tour is sponsored by CT National Organization of Women. Everyone welcome. Joan Wheeler has two paintings in the 24th Annual El Corazon Exhibition, curated by Jose Vargas, at the Bath House Cultural Center in Dallas, Texas. El Corazón has been one of the most popular art events at the Bath House Cultural Center since the show was first presented in 1993. 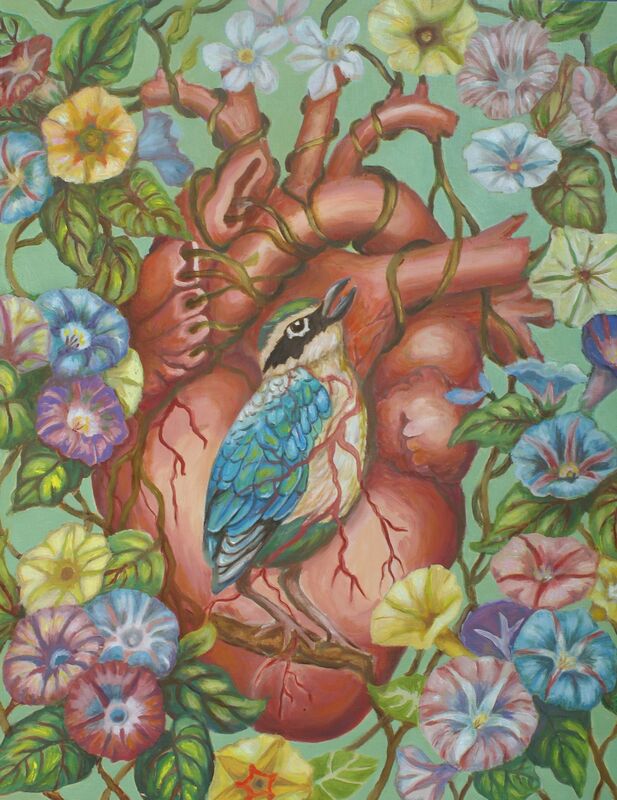 Every year, this Dallas exhibition presents over sixty regional, national and international artists with pieces that explore multiple interpretations of the human heart (El Corazón), an important and stimulating symbol in art. Show dates are Feb.3-March 17, 2018. At right, detail of Joan's Morning Glory (oil on wood panel, 11"x14"). Also see her The Heart's Journey. Elizabeth White has three images on display at Gologorski Gallery in Krakow Poland. The Gologorski Gallery, listed in the 10 best of Krakow, invited artists from 19 countries to participate in this "United" exhibition through February 5th. Click image for larger view. Her sculpture installation "Migration" may be seen on the roof of the mezzanine at the Mattatuck Museum through March. Sun. Feb. 4: Joy Bush, Attending to the Ordinary, City Gallery (994 State St, New Haven), Opening Reception 1-4pm. Thurs. Feb. 8: Ann Weiner, When Caged Birds Sing, Housatonic Museum of Art. Artist Talk, "Art as Activism," 7pm. Sat. Feb. 10: Bruce Horan, Same Day Different City. UConn, Stamford Art Gallery. Opening reception, 2-4:30pm. Sat. Feb. 10: Chris Perry, Altered Books, EBK Gallery, 218 Pearl St, Hartford. Opening Reception, 6-8:30pm. Sun. Feb. 11: MixMaster, Mattatuck Museum. Opening Reception, 1-3pm. Sun. Feb. 11: Joyce DiCamillo, Give Your Heart to Project Music, First United Methodist Church, Stamford, 3pm.